I admit that I don’t regularly swim in the murky and toxic waters of the culture pool, and I am neither a fan of Russell Brand nor Westboro Baptist Church, so this is not an endorsement of either one. Rather, the dialogue in the video provokes a bigger question for me. Why should anyone love a person who God hates? As I said, this dialogue provokes a bigger question for me (and for anyone who holds to a theology that concludes that God hates people — which I do not). The guys from WBC say multiple times in this video that they truly love Russell Brand and the audience members, but that (1) God hates them, and (2) They hate each other. But according to the WBC reps, the only people in the mix who truly love anyone are the WBC guys themselves because they are warning people to “stop sinning” lest they “burn in hell.” If their image of God is that God justly, rightly, and sovereignly hates people, then I don’t see why they — obedient servants of the God who hates people — would feel differently about people than God does. In the WBC theological and evangelistic schema, God hates, and they, his followers love. And his followers model the love that they have for the world by telling everyone how much God hates them. This, they believe, is the perfect combination to help people turn to the God who hates them so that he won’t send them to hell. I admit that I’m more than a little interested to see how those who can’t stomach the WBC brand, but who agree with their theology of God’s hatred for some people, will distance themselves from the WBC theological conclusions. By the way, as a disclaimer, this post fits well with Luke’s reminder that some of our posts are unrefined. If any WBC folks read this post (Steve? Timothy? Bueller?) please enlighten us. 1. 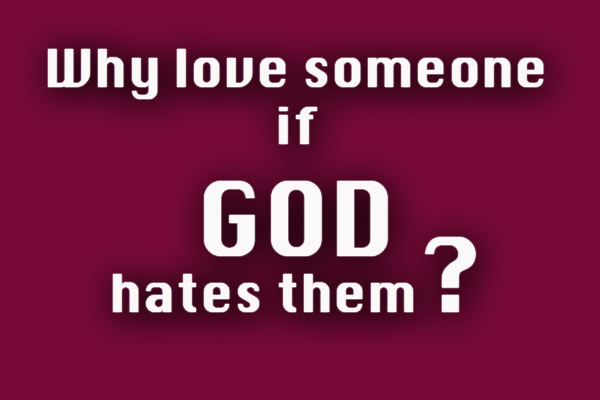 Why do you love people whom God hates? 2. Does this not set you above God as morally superior (since you’re the loving one here)? 3. Or is God’s hatred more virtuous than your love? 4. If you think God’s hatred is more virtuous than your love, why not repent of loving, and embrace the higher virtue of hate? Okay – Jump in. I’m gonna love, er, hate this. I’m so confused. In other words, their conclusions are based on deterministic sovereignty and the doctrine of reprobation (the extreme version of which, essentially teaches that God has fore-ordained most people to hell with no hope of escaping this pre-determined outcome). This doesn’t mean that WBC rightly understand or apply those doctrines, but embracing them as they have has lead them to their practical conclusions. As an aside, I always wondered why people who believe in the doctrine of reprobation would ever call people to repent who will not be able to do so, because God has ordained them to hell. The call to repentance is the offer of something that can never be appropriated by a divinely reprobated sinner. Again, why love people God hates? Agreed. And you point out the logical weakness and ultimate incoherence of this scandalously, narrow recognition of the “whole counsel of God”. Some believers can’t deal with the pattern of daily ‘crucifixion’ expressed in the tension of being “in” but not “of” the world, or “loving/doing good to those who persecute you, your enemies, etc.” while at the same time “hating evil/fearing the Lord”. As we’ve seen in the past and still see, mere logical “consistency” between isolated, premises and conclusions can sooner than later have us throwing our neighbors into ovens or nailing the creator of everything…to a cross, all in the name of…”good of the people” or “following God”. John 11:49-52, John 16:2. See also: Lord have mercy. It’s simple, really. God is meek. He delays His wrath until the proper time of judgment, and during that delay anyone can repent. During that time, the action of love is not contrary to the hatred by the eternal God but of a different scope–one of immediacy and hope of restoration. I don’t believe throwing the word “fag” around directly at the subject is reflective of God’s holiness, at all. It is neither love nor “holy hate”, it’s just slander. I meanwhile admit I’m more than a little interested to see how those who deny any notion of “God’s hate” can reconcile their denial with the torment of Hell and “God placing eternity in the hearts of men”. I believe that Hell is hate on display forever, but I also believe it is a “holy hate” that only God defines as holy and just. I mean, what is hate? I perceive it to mean to “despise someone and desire them subjected to be cut off from oneself even to the point of death”. I believe that describes Hell in the context of God and the men and women who reject Him perfectly. To that end. I think the notion that “God hates homosexuals” is absolutely true, but only in the eternal sense. In the immediate, linear sense, we must love them immediately, while they may still turn.